What are the physical properties of Mercury? Mercury’s diameter is a little more than one-third that of Earth’s, and it has just 5.5 percent of Earth’s mass. On average, Mercury is fifty-eight million kilometers (thirty-six million miles) away from the Sun. 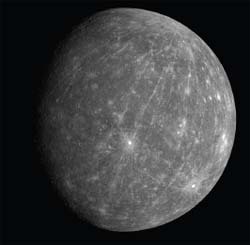 That is so close to the Sun that Mercury’s orbit is rather tilted and stretched into a long elliptical shape. Mercury orbits the Sun in just eighty-eight Earth days, but Mercury’s day—the time it takes to rotate once around its polar axis—is about fifty-nine Earth days. Mercury’s surface is covered with deep craters, separated by plains and huge banks of cliffs. Mercury’s most notable surface feature is an ancient crater called the Caloris Basin, which is about five times the size of New England—a huge pit for such a small planet! Mercury’s very thin atmosphere is made primarily of sodium, potassium, helium, and hydrogen. On its day side (the side facing the Sun), temperatures reach 800 degrees Fahrenheit (430 degrees Celsius); on its night side, the heat escapes through the negligible atmosphere, and temperatures plunge to 280 degrees below zero Fahrenheit (–170 degrees Celsius). A 2011 image of Mercury taken by a camera on MESSENGER. (NASA/Johns Hopkins University Applied Physics Laboratory/Carnegie Institution of Washington).